Dave needs to dump his toxic girlfriend Kristina to keep the band together. But it’s not that simple. She’s been keeping track of everything the band has done and threatens to expose them all. While under the stress of “managing” the situation and protecting his friends, Dave meets Willa, a street-wise girl with artistic talent who has been painting the city with graffiti. Will these two lost souls be able to heal each other? I need her to stay with me, as close as she’s willing, for an hour or maybe two while we pretend to be a band that isn’t the biggest f”ck-up on the planet. 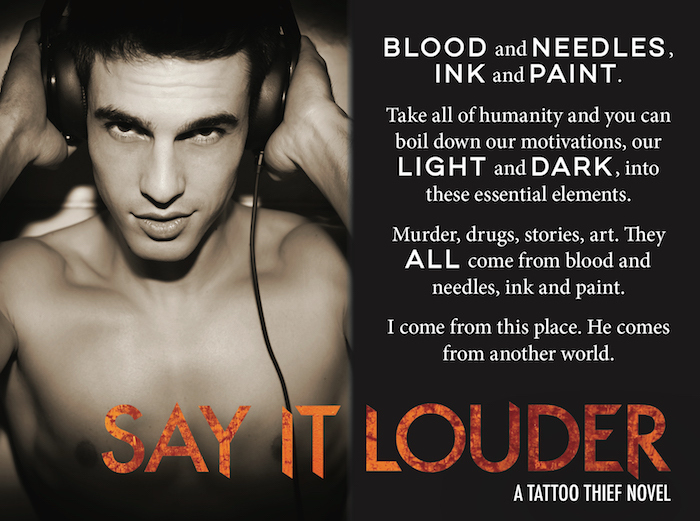 I read all of the Tattoo Thief books in preparation for this one and I was so happy I did. I think Dave’s story has been my favorite so far. Dave never felt like he fully belonged in the band. Like he was an outsider. What makes Willa such a good match for him is that she has felt that way her entire life. The two just seem to fit together and I loved that even though they might seem like they come from different backgrounds, they really had a lot in common. I also loved the mystery and tension throughout the story as they try to figure out how to deal with the threat of exposure, the tensions in the band and Willa’s new found talent being discovered. Lots of ups and downs while reading this one and I always look forward to twists in my stories. These books are a pretty fun rock band series and I would definitely recommend them. There is a fifth book planned and I look forward to reading more about this group of friends that have become a family.